I know this issue has already been addressed on other threads, but I'm at my wits end with this car. I've replaced the EGR valve, fuel pressure diaphragm, fuel pump, fuel pump relay, fuel pressure regulator, fuel pump cooling relay, fuel pump strainer, MAF sensor, TPS sensor, ECC, the PROM chip that goes with it, oxygen sensor, vacuum lines, spark plugs and wires, distributor cap, rotor, ignition module, and vacuum lines. I'm tired of dumping money into this car that does run better, but won't stop breaking down. Wow. Did you change the fuel filter? I did not see it on your list. The repair manual listed the fuel filter as an item to look at when engine stalls. I am sure a more knowledgeable member will help. Posts: 5 Yep, changed the fuel filter a few months ago. Posts: 2123 Please give us a little more info on what the car is doing. Stalls and then restarts later is vague at best. Posts: 5 When I start up the car and it's cold, it usually runs great, but after it's warmed up, and I get into slow speeds, such as approaching a stop sign or a red light, it will start surging, and eventually it will stall. It can't be restarted, requires a tow back home. I replaced the ECC and the PROM chip a few days ago, and that made it worse. It surged and stalled a few seconds after I started it up, when it was cold, before I could back it out of my garage. Posts: 2123 Have you checked for any codes set when it stalls? Next time it does stall after starting, before you turn the key off, check for codes(once you turn the key off, the codes will disappear). 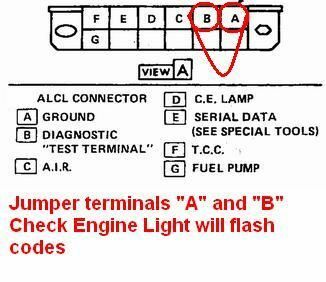 A scan tool for non-OBDII capabilities is quickest, but assuming you do not have one, on your car, you'll need to jump the "A" and "B" terminals of the diagnostic link(under the driver side dash). With key ON, it will flash the "Service/Check Engine" light. Count the flashes. Codes will appear as slow flashes, then quick flashes. The slow flashes are the first number of the code, the fast flashes are the second number. For instance, a code 45 would be four quick flashes, followed by 5 slower flashes. Each code will flash 3 times, then the next code will flash. Once it has flashed all codes, it will start over again with the first code. If there are no codes, you will see code 12 flash repeatedly. See if the ECM is seeing something that will shut the engine down....it will at least point you/us in the right direction. So the car just shuts down or it stumbles and dies? I have found sometimes the resistance goes way up on faulty injectors, and the computer shuts down. Posts: 5 It suddenly idles rough, then it dies. Posts: 5 I've been using a GM code reader that I bought at Advance Auto parts that's set at the ECMAB position, and I can't get any codes out of it. I've noticed that when the temperature gauge gets to 150 degrees, I think the radiator cooling fans are supposed to come on by then, but they don't, and that's when it shuts off. Also, the fuel pump cooling relay makes a buzzing sound, whether it's hot or cold, but sometimes it doesn't buzz, and when it does buzz, 9 times out of 10 the car will stall. And when I have it in gear, and the air conditioning on full, it'll stall within 30 seconds.